On the day we arrived Tokyo, we dropped our luggage at the hotel’s concierge and head out to explore the places surrounding our hotel (also to get familiar with the area). One of the few places we took note are the eateries nearby, the operating hours and price range. Even though we arrived Narita Airport early in the morning, after going through the immigration, finding our way out from the airport, took train to Tokyo and into Asakusa, we arrived our hotel at noon. Spotted this Yoshinoya outlet on our way to our hotel and decided to pop in for a quick meal, also our very first meal in Japan. Yoshinoya (吉野家) is said to be the largest gyudon (beef bowl) and also one of the Japanese chains of fast food. Most Yoshinoya outlets operate 24 hours and this outlet operates 24 hours and very near our hotel. So, we know where to head to whenever our tummy growls for food during wee hours. It’s a small shop with very minimal spaces. They fully utilise the free space for tables and chairs and even have dining counters. So, you kind of need to do the crab walk to move around especially when it’s packed with lunch crowd. Everything is so organised. You make your order and wait for your food. Eat and pay on your way out. Once seated, we were served with hot ocha (green tea) while we go through the menu. 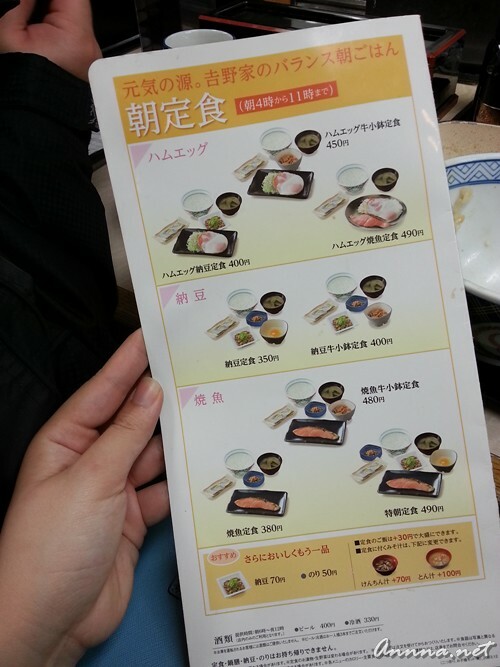 For a small outlet like this, it has quite an extensive menu. 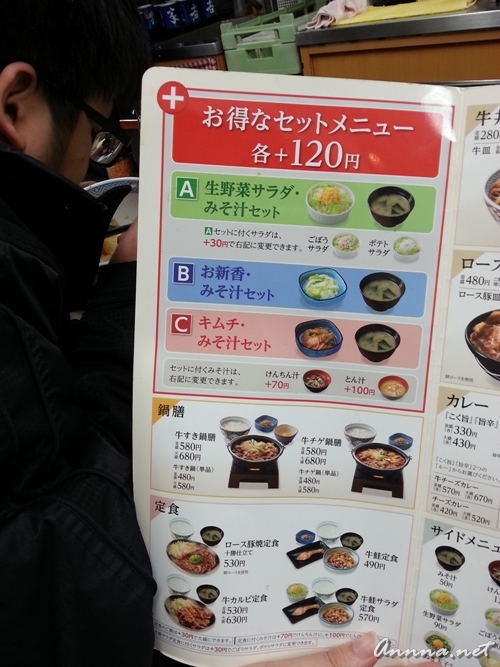 Yoshinoya is one of the top places the locals go for cheap eats, us included. Everyone is here for their Gyudon. 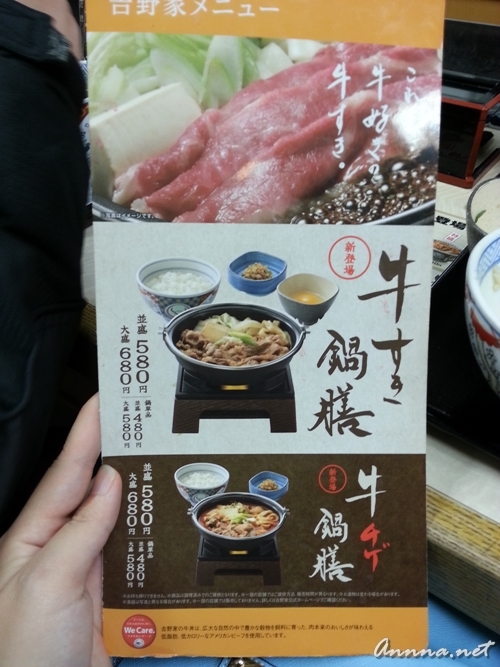 Gyudon (牛丼), literally beef bowl, is a simple yet popular dish in Japan. There are many chain restaurants which specialises/sells only Gyudon and Yoshinoya is one of them. A bowl of gyudon is usually served with beni-shoga (pickled ginger) and sliced negi (spring onion). For additional side dishes (such as soup, salad, raw egg, etc), all you need is to top up a bit of cash. A decent bowl of Gyudon starts from ¥280 (that’s approximately RM9) and there are various sets/combo/meals you can choose from the menu. In short, they are all value for money! I was feeling very hungry as I flipped the menu and I ordered myself a set of Ushi Negi Gyokudon (牛ねぎ玉丼), which is a bowl of gyudon served with sliced spring onion and raw egg. I reckoned that the raw egg would give a richer and creamier flavour to the gyudon. A bowl of delicious simplicity of white rice topped with seared strips of caramelized onions and very thin beef strips. They have this egg tool which separates the egg yolk and egg white. Am amazed with the tool. I wonder if anyone is going to franchise this outlet into Malaysia. I’m so missing it already. Perhaps, I’ll try making my very own gyudon. We’ll see about it.